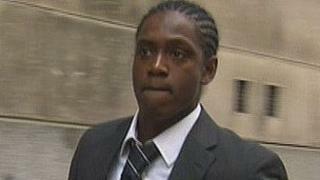 Newcastle United footballer Nile Ranger has been fined £3,300 after admitting drinking and driving. The 20-year-old striker was arrested in the early hours of 11 September after he was pulled over in his Range Rover in Newcastle city centre. Ranger was banned from driving for 12 months after receiving credit for his early guilty plea. He arrived at Newcastle Magistrates' Court in a taxi and wore a suit and trainers for the hearing. Tests showed he had 94 milligrammes of alcohol in 100 millilitres of blood. The legal limit is 80 milligrammes. Keith McIntosh, chairman of the bench at Newcastle Magistrates' Court, said the £3,300 fine was based on Ranger's salary, which was not revealed in open court. The player was ordered to pay a further £15 surcharge and £85 costs. Geoffrey Forrester, defending, said Ranger had "no idea" he was over the limit when he was stopped and was co-operative with police. He added: "It's important that he was just the wrong side of the limit." Mr McIntosh told Ranger: "When someone has a drink they are not aware how much alcohol they have taken with regards to the law. "The best advice we can give is not to drink and drive." The ban could be reduced by three months if Ranger passes a drivers' awareness course. He was driven home after the case by his solicitor.